Share the post "Alumni Story: Jonathan Kolby (CC’03) – Friend of the Frogs"
When he was a young boy, Jonathan Kolby spent most of his free hours outdoors “running around in the woods, catching frogs and turtles.” Not much has changed since then, although now he spends his time in the wetlands of such places as Honduras, Nicaragua, Australia and Kenya, studying the diseases that are threatening the very existence of amphibians worldwide. Growing up in Union, New Jersey, Jonathan got an early start on his work with amphibians. At age 15, he had the opportunity to join James Lazell of The Conservation Agency, a Rhode Island-based 501(c)(3), on an expedition to survey reptile and amphibian biodiversity in Hong Kong and China. That experience cemented his interest and directed his future career in research. He chose Rutgers and the George H. Cook Campus for college because “it is in a really green spot in New Jersey and offered the courses in biological sciences that would advance my personal interest in amphibians,” he says. After graduating in 2003 with a degree in biological sciences, he went to work for the U.S. Fish and Wildlife Service and came across the National Geographic Young Explorers program, which awards scientists between the ages of 18 and 25 grants of up to $5,000 for field research around the globe. 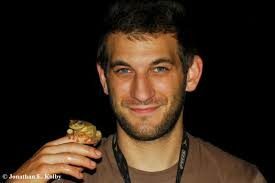 Successful in his grant application, Jonathan used the funds to travel to Honduras to determine whether endangered frogs were infected by the pathogenic chytrid fungus (Batrachochytrium dendrobatidis or Bd), a scourge that is wiping out amphibian populations around the globe. 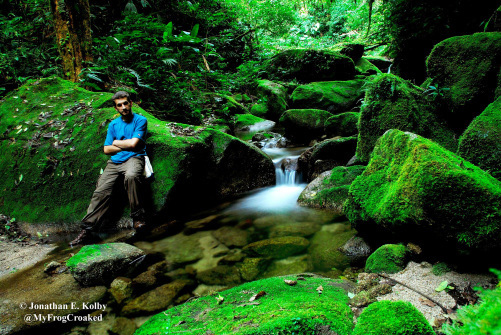 His research in Honduras is aimed at understanding how the disease is spread, if there are amphibian populations that have developed a resistance and, ultimately, to help the species rebound. “At my study site in Honduras, this pathogen persists in the water and appears primarily to kill juvenile frogs before they reach maturity. The adult frogs that are fortunate enough to survive the transition from juvenile to adult might possess some degree of innate resistance to the fungus,” he adds. His group in Honduras is building a rescue facility where juvenile frogs from Cusuco can be treated for chytrid infection and raised in a safe environment until they are adults. Then they will be re-introduced to the rainforest where they can breed naturally and help replenish their populations. “We know we can never get rid of the disease, but if we can help populations survive as natural selection continues, these endangered frogs might have a chance to develop resistance to this disease over time,” he says. To learn more about Jonathan’s work in Honduras, visit FrogRescue.com. Or view the center’s video on You Tube.